Guest Hunter Josh Gates joins the TAPS team as they investigate an Hammond Castle in Gloucester, Massachusetts, minutes away from Josh's childhood home. The castle was constructed between 1926 and 1929 for inventor John Hays Hammond Jr as a wedding present for his new bride Irene. The two secretly married in 1926. Hammond is known as the "Father of Remote Control". He held over 400 patents, more than anyone other than Thomas Edison. His home and laboratory contains his 15th, 16th and 18th Century collection of Roman, Medieval and Renaissance artifacts including the skull of one of Christopher Columbus' crewman, an eighty-five foot tall pipe organ, and the tomb of a child from Ancient Rome. Irene died in 1959 and Hammond's death came years later in 1965. Irene was buried in her family's plot in the Gloucester's Mount Pleasant Cemetery. Hammond was buried in the sepulcher until his body was moved in to the bronze vault inside the Cat Garden a few years ago. 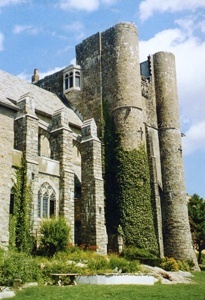 Today, the building operates as the Hammond Castle Museum and is transformed in to a haunted attraction known as Castle of the Damned in October. Hammond and his wife were known Spiritualists and performed many seances with psychics. During their experiments, did they invite spirits in their home who have never left? Hammond collected many historical artifacts. Were spirits attached to them? Either way, the castle is host to numerous paranormal reports. It is believed Hammond and his wife haunt the building. Their spirits have often been seen throughout Hammond Castle. Items disappear, reappear and move on their own. Voices are heard in the circular library as well as other rooms. A ghostly red-haired woman and other spirits appears among guests during weddings and disappears whenever anyone gets too close to them. A shadow figure is seen on the balcony above the organ. Why didn't they investigate the hidden passage way?